We provide free, confidential advice to help people overcome their problems. We offer information, representation, guidance and support and we campaign on big issues when people’s voices need to be heard. Our aim is that everyone who needs our help will be able to obtain free advice to find a way forward. Fairness and impartiality are at the heart of our service. We value diversity, champion equality and challenge discrimination and harassment. We take up disputes with local councils, various government departments, with gas and electricity suppliers and many other bodies, who know that legitimate complaints will be pursued efficiently. Annually, we help around 7,000 people. As well as helping individuals with their problems, we put their experience to good use, and, where appropriate, we campaign for change – both at local and national level. This work, also called social policy, relies on anonymised analysis of client issues to identify any trends that need addressing. We offer advice through a choice of channels, the majority of it is provided face-to-face. A client arriving at our offices at 1 Church Road, Southend-on-Sea, SS1 2AL between 10am and 3.30pm Monday to Friday with a new issue will be greeted by our receptionist and invited to wait for an interview to assess their situation. Often, it’s possible to deal fully with the issue at that initial interview. In certain circumstances, we will arrange an appointment for the client to attend again to see either a generalist adviser or a specialist adviser. Alternatively, the client may be referred to another agency that is able to deal with the issue better than we can. Our advisers listen to the client and offer them options to move them forward as much as possible towards resolving their problem. Sometimes, there is no solution, and they have to help people to come to terms with this. As well as offering advice from our own offices we provide outreach sessions at a number of locations across the town. We also undertake assessments by telephone. We do this through our membership of Adviceline, which operates as a virtual call centre for Citizens Advice offices across Essex. The Adviceline number is 0344 477 0808 and operates from 10am to 4pm, Monday to Friday. www.citizensadvice.org.uk. Advice is provided by webchat and email through the national service accessed through the website. 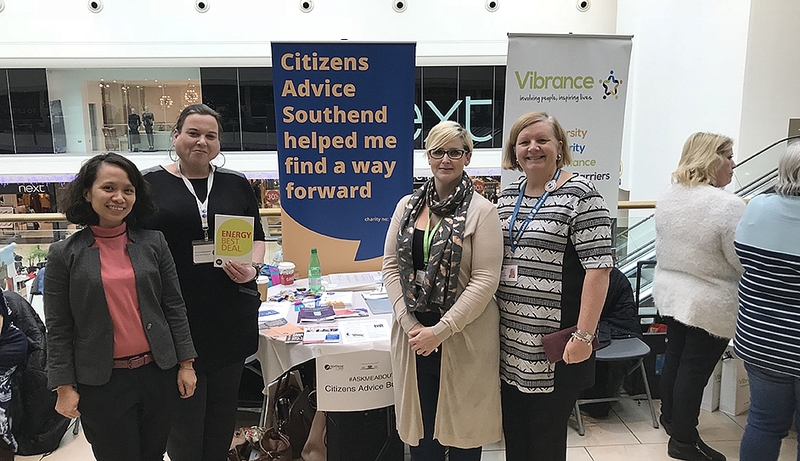 We are on Twitter (@CitizensAdviceSonSea) and Facebook (Citizens Advice Southend) where we post information about our campaigns and news about our services. As a result, some clients are able to obtain all the information they need without having to make an appointment to see or speak to an adviser. For others, the online information offers guidance as to when they should seek further help at a local Citizens Advice. This not only benefits those individuals, but also allows more time for us to deal with other, more complex issues. We currently employ 18 paid staff and we have a much larger body of around 86 volunteer workers, without whose efforts we would be unable to provide the level of service we do. Our staff and volunteers represent our greatest asset, and we have enjoyed their loyalty and dedication through the years and continue to do so. Make a donation - as a registered charity we welcome donations to enable us to keep Citizens Advice a free service.